The drawers we build are made of either plywood or solid wood. Both are dovetailed, built to last, and hold about 90lbs of goods. Dovetail drawer box with 5/8″ solid soft maple sides and ends. The 1/4″ maple veneer bottom is dadoed into all 4 sites. 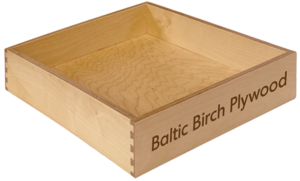 Dovetail drawer box with 5/8″ baltic birch plywood sides and ends. The 1/4″ maple veneer bottom is dadoed into all 4 sides.